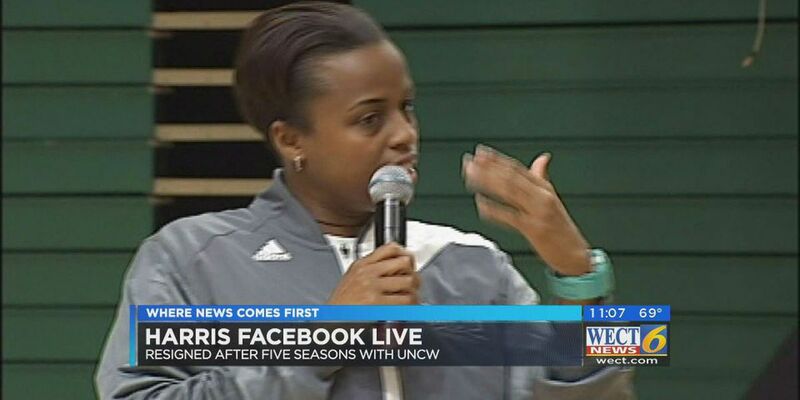 Adell Harris resigned as the head coach of UNCW women's basketball April 11. Monday, on Facebook Live, she delved into what inspired her decision and what her next step is from here. "I wasn't fired, I wasn't asked to step down," Harris said, during a 45-minute Facebook Live stream. "I chose to because I had given everything I got. I've got nothing else to give. I'm not trying to go to another school and coach basketball right now. I'm not trying to go outside and watch basketball right now. LeBron is playing right now and I don't want to see him." Harris was hired as the Seahawks head coach in the summer of 2012. She compiled a 42-92 record in five seasons with the Seahawks. This past season UNCW went 11-20 overall and 5-13 in the CAA. "You talk about winning and losing games, it's hard to win. I don't care if you've got all the resources or no resources," she said. "I'm not sure that I wouldn't have gotten fired at some point, but that's not what happened." The 2015-2016 season was one in which the Seahawks were depleted by year's end with only six healthy players. Heading into the 2016-2017 season, Harris was optimistic, saying the team had the potential to be the best in the history of the program. Despite the way the season concluded, Harris remains optimistic about her future. "I'll take my failures and my losses any day. I'm excited about whatever's next, because I know I've been tested. Without a test you've got zero testimony. I know I've been bent, but I've never been broken. I'm good. "I gave it everything I got. I'm happy with that. I'm really happy with it."